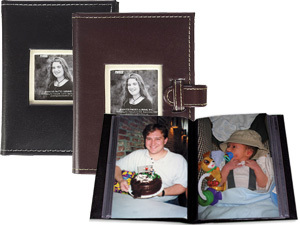 This sewn leather-like 4x6 photo album includes a photo frame cover and stitched strap-closure. Clear 1-up plastic pockets with black mesh background. This sewn leather-like album includes a photo frame cover and stitched strap-closure.